Did you know there are at least 40 species of flying fish? Yes, really! I’m sure you’re well aware that fish swim in water and birds fly in the air, but did you know that some fish can actually fly in the air among the birds? Well, it’s true. In fact, according to National Geographic there are at least 40 species of flying fish that inhabit the world’s oceans! These amazing creatures can propel themselves out the water and into the air where they can use their wing-like fins to glide hundreds of feet. The actual distance they can glide in one session depends on the lift provided by the prevailing air currents above the ocean’s surface. The thing is, these fish don’t use their flying ability just to have a little fun. They use it to stay alive! As long as they’re in the water these fish are constantly in danger of being eaten by a wide variety of larger fish. If a predator starts chasing them they’ll build up a head of steam and propel themselves out of the water, then spread their large wing-like fins and glide through the air to avoid becoming the larger creature’s dinner. But once airborne they have to face yet another danger: Countless Frigatebirds that patrol just above the ocean’s surface waiting to catch a flying fish as soon as it exits the water and goes airborne! 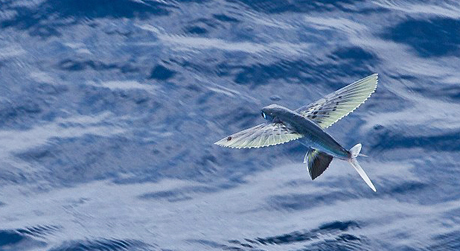 In short, a flying fish’s entire life is spent either eating or avoiding being eaten. The ability to fly at least gives them a chance to survive the nearly constant onslaught of their many predators. Here’s a fascinating short video that shows some flying fish in action as they try to avoid the dangers they face both below the surface and in the air. Check it out! Pretty amazing, right? I guess it’s just all a part of the endless circle of life. Credits: Photo courtesy of Mike Prince.